The Internet is massive and the number of sites offering free content on it is even more so. Keeping up with the latest posts from websites continues to become more and more difficult as your list of favorite sites continues to grow. There’s so much wonderful content and practically no time to sit down and open up all of the websites. Really Simple Syndication (RSS) simplifies how we browse, view, and digest the content produced by our favorite sites. In this article, we’ll present a breakdown of how you can use RSS feeds and WP RSS Aggregator. Finally, we’ll wrap up with a section on how you can move content from an old blog site to a new blog site with the incredibly powerful WP RSS Aggregator plugin. From another perspective, RSS feeds can be used by webmasters to aggregate several different RSS feeds from different sources and display them on their site as posts to deliver value. WP RSS Aggregator, for instance, allows webmasters to configure the RSS feeds they’d like to import from a given feed source once and then forget about it – it’ll do the rest! 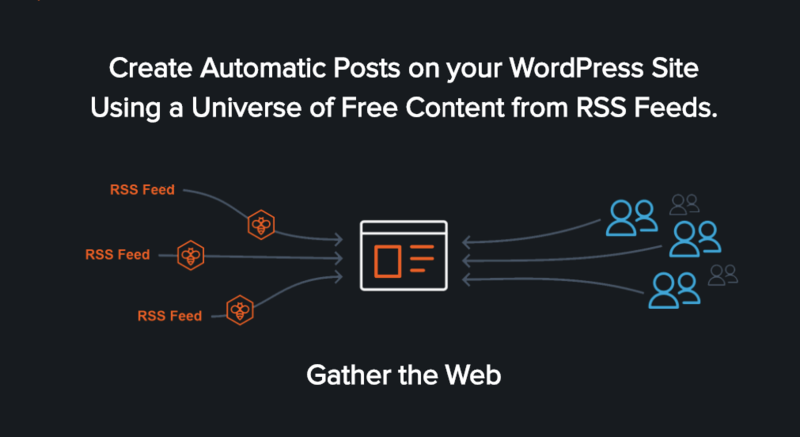 WP RSS Aggregator is a feature-rich RSS aggregation plugin for WordPress that makes it easy for non-techy webmasters to import, merge, and display RSS feeds on their site with shortcodes. To kickstart things, the free version of the plugin enables users to import however many RSS feeds they’d like directly to their website and display them within posts or pages. The plugin also comes with powerful, premium add-ons that enhance the basic functionality. The advanced functionality allows users to create posts automatically, include categories, display full text, present excerpts and thumbnails, filter out keywords and much more.